Written By: Cns Jonny Bowden, Ph.D., Stephen T. Sinatra, M.D. Heart disease is the #1 killer. However, traditional heart disease protocols-with their emphasis on lowering cholesterol-have it all wrong. 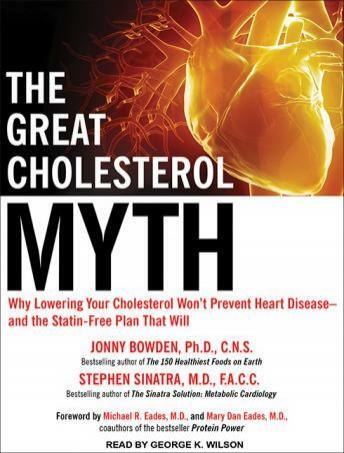 Emerging science is showing that cholesterol levels are a poor predictor of heart disease and that standard prescriptions for lowering it, such as ineffective low-fat/high-carb diets and serious, side-effect-causing statin drugs, obscure the real causes of heart disease. Even doctors at leading institutions have been misled for years based on creative reporting of research results from pharmaceutical companies intent on supporting the $31-billion-a-year cholesterol-lowering drug industry.The Great Cholesterol Myth reveals the real culprits of heart disease, including: Inflammation Fibrinogen Triglycerides Homocysteine Belly fat Triglyceride to HCL ratios High glycemic levelsBestselling health authors Jonny Bowden, Ph.D., and Stephen Sinatra, M.D. give listeners a four-part strategy based on the latest studies and clinical findings for effectively preventing, managing, and reversing heart disease, focusing on diet, exercise, supplements, and stress and anger management.Get proven, evidence-based strategies from the experts with The Great Cholesterol Myth. This book is critically important for any person who is either presently taking a statin drug or has been advised by their doctor to start on one. You will learn cholesterol is not the demon it's made out to be and statins are not the savior. In fact, the opposite is true! Incredible Book. Do yourself a life changing service and buy it! by Cns Jonny Bowden, Ph.D., Stephen T. Sinatra, M.D.